Lens and camera manufacturer Sigma has released three firmware updates that improve the functionality of its sd Quattro camera, the company’s MC-11 mount adapter and the two versions of its 150-600mm F5-6.3 zoom lens. The update to the sd Quatrro camera deals with an issue that causes the camera to freeze when being controlled via the company’s Capture Pro tethered-shooting software package, while the update for the MC-11 prepares the device for Sigma’s new and forthcoming 12-24mm F4, 500mm F4 and 85mm F1.4 lenses. The MC-11 allows users to mount certain Sigma EF- and SA-mount lenses to Sony E-mount cameras, and the update improves AF accuracy of EF-mount lenses that aren’t fully compatible with the system. It also allows lenses with Optical Stabilizer built-in to switch off in-body stabilization systems to use the in-lens system even when the lens isn’t fully compatible with the MC-11. With the firmware installed the start-up time of the combination is also improved. AF accuracy is also the main theme of the update to the 150-600mm F5-6.3 DG OS HSM Sports and Contemporary lenses in the Canon and Sigma mounts. The lenses will perform better when used with the MC-11 mount adapter, and with the sd Quattro in the case of the Sigma mount version. The update also reduces the sound made by the aperture blades in the Canon mount versions during filming both with and without the MC-11 – and the lenses are now fully functional with the Canon Digital Cinema Camera EOS C300 Mark ll. Those with the Sigma USB dock can install these updates themselves, and those who don’t have it can take their lenses and MC-11 to a Sigma approved service center and have the firmware updates installed for free. For more information visit the Sigma website. Sigma Corporation is pleased to announce that new firmware of SIGMA sd Quattro is available for download. It corrects the phenomenon where the camera stops responding to any operation after pressing [AF Capture] button, [AF Drive Only] button, and/or [MF Capture] button on SIGMA Capture Pro during shooting using SIGMA Capture Pro. * SIGMA Photo Pro 6.4.1 is required to develop RAW data (X3F files, X3I files) taken with sd Quattro cameras with firmware Ver1.02 or later. 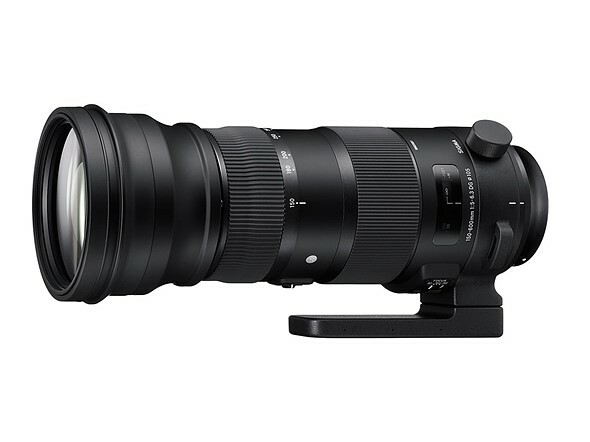 We would like to announce the availability of a new firmware update for the SIGMA 150-600mm F5-6.3 DG OS HSM | Sports in SIGMA and Canon mount, and the SIGMA 150-600mm F5-6.3 DG OS HSM | Contemporary in SIGMA and Canon mount. The firmware can be updated using SIGMA Optimization Pro. The lens firmware update improves the AF accuracy and reduces the operating sound of the diaphragm blades when it is attached with the SIGMA MOUNT CONVERTER MC-11. For customers who own the following applicable products and the SIGMA USB DOCK, please update the lens firmware using SIGMA Optimization Pro. It has improved the AF accuracy when the lens is attached with the SIGMA MOUNT CONVERTER MC-11. For customers who own SIGMA MOUNT CONVERTER MC-11, it is necessary to update this to the latest firmware Ver1.02. It has improved the AF accuracy of this lens when mounted on the SIGMA sd Quattro (SIGMA mount only). It is fully functional with the Canon Digital Cinema Camera EOS C300 Mark II. *1 The degree of improvement differs depending on the camera used. Please ensure the SIGMA Optimization Pro has been updated to Ver1.3.1 or later from the following download page before updating the lens firmware. We would like to announce the availability of a new firmware update for the SIGMA MOUNT CONVERTER MC-11 EF-E and SA-E. This firmware update supports the following new products; SIGMA 12-24mm F4 DG HSM | Art, which we started the delivery from October 2016, SIGMA 500mm F4 DG OS HSM | Sports and SIGMA 85mm F1.4 DG HSM | Art, which are scheduled to be delivered from November 2016. In addition, it has improved the operation when some lenses that are not fully compatible are attached. It has also corrected the phenomenon where the distortion correction figure is not indicated properly in the camera when the SIGMA 24-105mm F4 DG OS HSM | Art is attached. For customers who own the SIGMA MOUNT CONVERTER MC-11, please update the firmware using SIGMA Optimization Pro. Please ensure the SIGMA Optimization Pro has been updated to ver1.3.1 or later from the following download page before updating the MC-11 firmware. It is fully functional with the SIGMA 12-24mm F4 DG HSM | Art, the SIGMA 500mm F4 DG OS HSM | Sports and the SIGMA 85mm F1.4 DG HSM | Art lenses. When lenses with Optical Stabilizer (OS) function that are not fully compatible with the SIGMA MOUNT CONVERTER MC-11 are attached with the SIGMA MOUNT CONVERTER MC-11 and mounted on a camera which incorporates a stabilizer unit, it enables the camera’s stabilizer unit to be turned off and the lens’s OS function to be turned on and off. It has improved the AF accuracy of Canon EF lenses that are not fully compatible with the SIGMA MOUNT CONVERTER MC-11 (EF-E only). It has corrected the phenomenon where the distortion correction figure is not indicated properly in the camera, when the SIGMA 24-105mm F4 DG OS HSM | Art is attached.